“I don’t want it to look like his,” Trimble replied in mock horror, pointing out that Sulaimon, his 22-year-old road-trip roommate, is going bald. Then, as often happens in the Sulaimon-Trimble relationship, the younger Trimble let out a big, hearty laugh. Fifth-seeded and No. 18 Maryland won its first-round game over South Dakota State, 79–74, Friday night in Spokane Arena, shooting a stellar 24 of 27 from the free-throw line to stave off a late rally from the 12th-seeded Jackrabbits. Maryland got 27 points from senior forward Jake Layman and 14 points from sophomore reserve swingman Jared Nickens, but it was the play from Trimble and Sulaimon, one of the best guard tandems in the country, that kept Maryland from avoiding a first-round upset. Before fouling out with a minute to play, Trimble had scored 19 points on 5-for-10 shooting (including 9 of 9 at the free throw line) and grabbing three rebounds. Sulaimon scored only seven points (3 of 8 from the field) but snagged four steals, including one with three seconds to go that he finished with a game-sealing dunk. He might not have shot particularly well, but Sulaimon, a Duke transfer, gives the Terps a calm, poised presence on the floor. It’s his job, he says, to remind everyone to take a deep breath, stay calm in the chaos and remember to execute. After all, Sulaimon understands better than anyone else on this roster what it takes to make a deep run: As a freshman for the Blue Devils in 2012–13, he averaged 29.2 minutes and 11.6 points on an Elite Eight team. He also knows the risk of overlooking a lowly seeded opponent: He was also part of the Duke team that lost to 14th-seeded Mercer in the first round. Through those experiences, Sulaimon has learned a few things. Most notably, that people like him need to run the show. Sulaimon said Maryland coach Mark Turgeon had stressed the importance of a close relationship between his starting guards in the summer. Sulaimon put the suggestion into practice, particularly using road trips—the two room together—to build a stronger friendship with Trimble. He teases Trimble about his primping routine—“that kid thinks he’s a male model,” Sulaimon said, rolling his eyes—and stays positive when criticism comes at his younger teammate. Trimble and Sulaimon laughed when asked how many times they’ve been asked about the “Maryland has underachieved” narrative, saying they’ve lost count of the questions that begin and end with some version of, Why aren’t you guys better? The postseason is a chance to stop those questions, Trimble said, and there are few who would deny Maryland has the talent to do so. It has the guards, the bigs, the balanced scoring (all five starters average double figures) and the free-throw shooting (78.6%). It has yet to peak. With fourth-seeded Cal falling to Hawaii, Maryland is a win over a mid-major away from its first Sweet 16 since 2003. Of course Sulaimon won’t assume a win is imminent. It’s a postseason full of surprises. 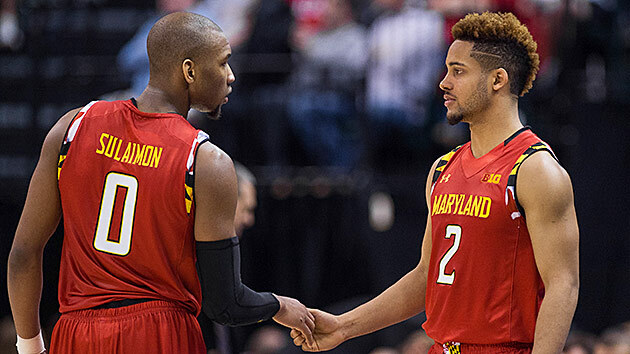 Maybe by the end of the month, Maryland will be booking its trip to the Final Four. Or maybe his roommate will learn how to get ready in less than 30 minutes. Hey, Sulaimon said, anything is possible.